Author: Andrew Vepers, B. Eng., MIOA. Thermafleece has been tested for it’s acoustic properties, which means that it can now be specified as part of your noise control scheme. b) achieving the appropriate “acoustic atmosphere” within a room. If the room is too reverberant (“echoey”) it can be uncomfortable, or it may not be possible to understand the words of a public speaker. This can be remedied by increasing the acoustic absorption in the room. As well as providing thermal insulation when placed in the cavity of a partition wall, Thermafleece adds a significant amount of sound insulation. The graph shows the difference in sound insulation values between a stud wall with an empty 100mm cavity, and the same construction, but with a 100mm quilt of Thermafleece in the cavity. 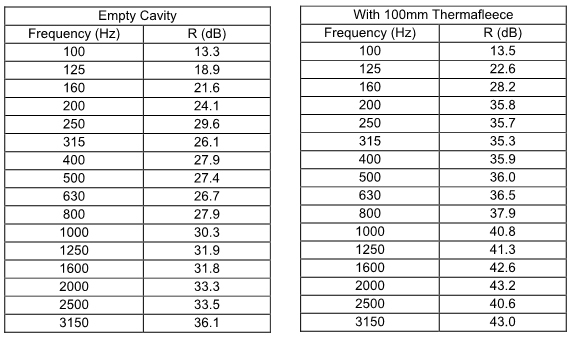 Sound insulation has been improved by around 10dB through much of the frequency range. A 10dB reduction is akin to halving the level of sound that a person would experience. Measurement of airborne sound insulation was made in accordance with BS EN ISO 140: Part 3 (1995). 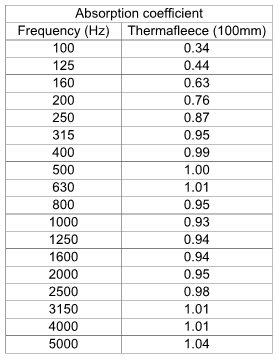 Measurements made by BRE (UKAS accreditted for the measurement of sound insulation in the field and the laboratory), November/December 2002. Thermafleece can help to absorb sound to reduce the reverberation time of echoey rooms. The product has been tested according to ISO 354:1985 / BS EN 20354:1993, Measurement of absorption in a reverberation room. 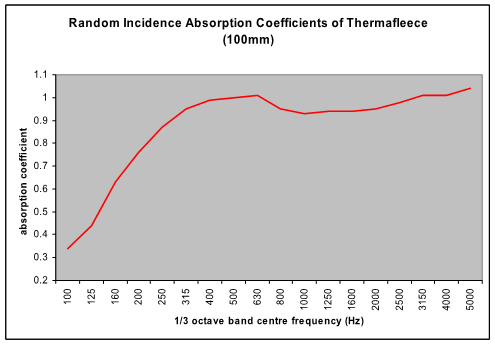 Thermafleece shows excellent acoustic absorption properties, with some useful absorption available at the low frequency end of the spectrum. engineers to make reverberation time calculations. Measurement of acoustic absorption made in accordance with ISO 354:1985 / BS EN 20354:1993. Measurements made by The University of Salford (UKAS accreditted), July 2003.